Trappers Hut provides the high bonus to the trade as well as a happiness increase if there are furs resources in region. The bonus is much higher in the winter fur hunting season. Animal trapping is perhaps one of the first methods of hunting. "Modern" Steel jaw-traps were first described in western sources as early as the late 16th century. The first mention comes from Leonard Mascall's book on animal trapping. It reads, "... a griping trappe made all of yrne, the lowest barre, and the ring or hoope with two clickets...". Trapping was widely used in the early days of North American settlements (such as the Canadian Fur Brigade). Native Americans trapped fur bearing animals with pits, dead falls, and rudimentary snares. A dead fall is a heavy rock or log that is tilted on an angle and held up with branches, one of them that serves as a trigger. When the animal moves the trigger which may have bait on, or near it, the rock or log falls, crushing the animal. The four figure dead fall is a popular and simple trap constructed from materials from the bush. Before the colonization of the Americas, Russia was a major fur supplier of Western Europe and parts of Asia. Fur was a major Russian export since the early middle-ages. 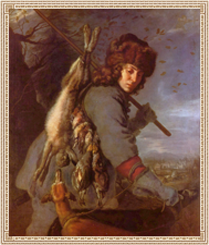 Originally the majority of furs exported from Russia were pelts of martens, beavers, wolves, foxes, squirrels and hares.